For those of you following me on social media and still thinking this is a joke, it’s not. Well, maybe it is. It’s actually kind of complicated. 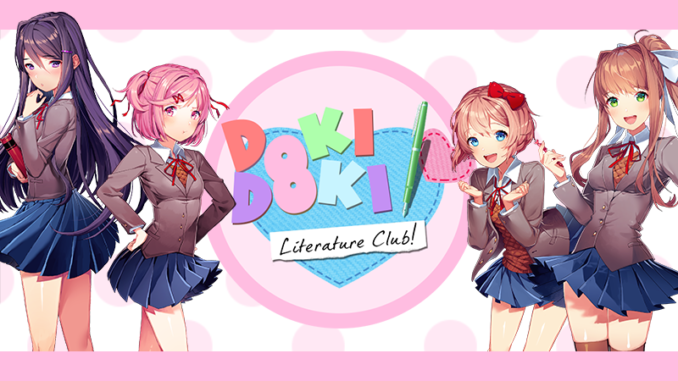 Doki Doki Literature Club has been in development for almost 2 years. The total play time from the start to the end credits is, on average, 4-5 hours. There is a lot of content that can’t be seen in only a single playthrough, so different players will have different experiences playing the game. I hope this leads to some fun streams, discussion, and sharing stories of your experiences. Speaking of streams, we have some big streamers who will be playing DDLC, with giveaways too! Be sure to follow Team Salvato on Twitter for updates on stream times. Thanks to all of my friends who supported development of DDLC these past couple years. Everyone I know has been really excited for this release, and I hope you give it a chance and discover why.